We study the optimal control of a class of resource allocation problems characterized by energy-latency trade-offs in Wireless Sensor Networks (WSN) using the framework of Discrete Event Systems. Our work is based on the observation that energy of wireless nodes can be greatly saved by introducing some delay of task completion time. Specifically, we consider a family of problems motivated by WSN such as Dynamic Transmission Control and Dynamic Voltage Scaling, where the objective is to minimize energy consumption while satisfying real-time operating constraints. Using advanced techniques, such as sample path analysis and Receding Horizon Control, we address both off-line and on-line scenarios and have found better and more efficient solutions than the existing ones in the literature. Our results do not rely on the exact form of the cost function and can be readily applied to other settings as long as the cost function satisfies certain conditions. This work is beneficial to students, scholars, and engineers who are interested in utilizing advanced control and optimization techniques to solve resource allocation problems in wireless networks. The rapid evolution of computing, communication, and sensor technologies has brought about the proliferation of new dynamic systems, mostly technological and often highly complex. Examples are all around us: computer and communication networks; automated manufacturing systems; air traffic control systems; and distributed software systems. The “activity” in these systems is governed by operational rules designed by humans; their dynamics are therefore characterized by asynchronous occurrences of discrete events. These features lend themselves to the term discrete event system for this class of dynamic systems. A substantial portion of this book is a revised version of Discrete Event Systems: Modeling and Performance Analysis (1993), written by the first author, which received the 1999 HAROLD CHESTNUT PRIZE awarded by the International Federation of Automatic Control for best control engineering textbook. This new expanded book is intended to be a comprehensive introduction to the field of discrete event systems, emphasizing breadth of coverage and accessibility of the material to readers with possibly different backgrounds. Its key feature is the emphasis placed on a unified modeling framework that transcends specific application areas and allows linking of the following topics in a coherent manner: language and automata theory, supervisory control, Petri net theory, (max,+) algebra, Markov chains and queuEing theory, discrete-event simulation, perturbation analysis, and concurrent estimation techniques. Until now, these topics had been treated in separate books or in research literature only. Introduction to Discrete Event Systems is written as a textbook for courses at the senior undergraduate level or the first-year graduate level. It will be of interest to students in a variety of disciplines where the study of discrete event systems is relevant: control, communications, computer engineering, computer science, manufacturing engineering, operations research, and industrial engineering. – Solutions to all problems are available directly from the authors. – Additional software, interactive web sites, animated presentations on special topics related to Discrete Event Systems are listed in Related Web Sites. The authors would appreciate to hear your comments on the book, suggestions, specific questions, or any issue related to Discrete Event Systems. Resources including a multimedia introduction to Discrete Event Systems and a number of interactive java applets. The library of routines UMDES-LIB. Information on the software package CTC. 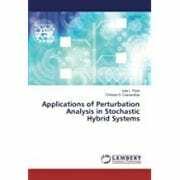 Cohesively edited by leading experts in the field, the book introduces the theoretical basics, computational methods, and applications of SHS. It first discusses the underlying principles behind SHS and the main design limitations of SHS. Building on these fundamentals, the authoritative contributors present methods for computer calculations that apply SHS analysis and synthesis techniques in practice. The book concludes with examples of systems encountered in a wide range of application areas, including molecular biology, communication networks, and air traffic management. It also explains how to resolve practical problems associated with these systems. Stochastic Hybrid Systems achieves an ideal balance between a theoretical treatment of SHS and practical considerations. The book skillfully explores the interaction of physical processes with computerized equipment in an uncertain environment, enabling a better understanding of sophisticated as well as everyday devices and processes. Discrete Event Systems: Modeling and Performance Analysis is the first instructional text to be published in an area that emerged in the early 1980s and that spans such disciplines as systems and control theory, operations research, and computer science. Developments in this area are impacting the design and analysis of complex computer-based engineering systems. Designed for seniors and first-year graduate students, the book shows where Discrete Event Systems (DES) appear in modern technological environments, such as computer networks, automated manufacturing processes, and airport and highway traffic systems. The text provides a unified framework for modeling, design, analysis, and control of these “man made” dynamic systems. Explain the characteristics of DES and show how they differ from classical systems. Describe the differences between various modeling approaches, from simple to more complex untimed to timed, and deterministic to stochastic. – The classical probabilistic approach, using stochastic process theory. – Computer simulation and sample path analysis. Show how to simulate DES using commercially available software or from first principles. Provide the basis for further study in such areas as advanced queuing theory, dynamic control of DES perturbation analysis, and sample path constructability techniques. Focus on the timed aspects of DES. The fundamentals of untimed models and analysis are presented in Chapter 2 to give the student an overview of the entire field. Introduction to queuing theory (Chapter 6) as a method of analysis and performance evaluation. Introduction to the dynamic control of queuing systems and problems such as admission control, routing, and scheduling (Chapter 7). Discussion of sensitivity analysis and techniques of sample path constructability for DES to introduce readers to recent research in the field (Chapter 9). Explicit instructions for building discrete event simulation models. Computer codes illustrating perturbation analysis algorithms. basic course on probability theory and some knowledge of stochastic processes. Familiarity with concepts from signals and systems. Elementary differential equations and linear algebra. A new version of this book, co-auhored by Stephane Lafortune, was published in 1999. A Second Edition was published in 2006. Click here for the publisher.